One of Mystery Island's most popular attractions, Gadgadsgame celebrates the festival of fruit, Gadgadsbogen. 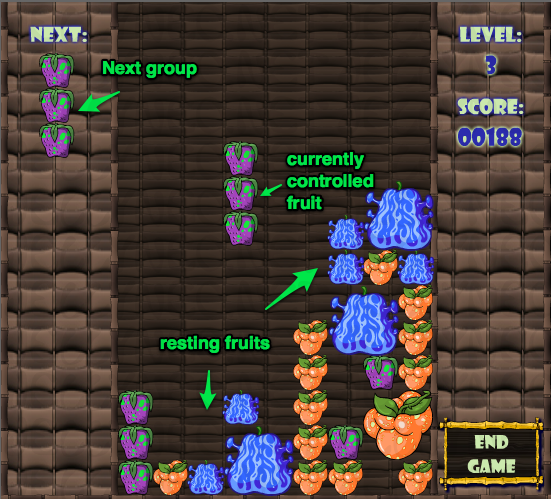 In this game you will be presented with strings of fruit and your task is to group together similar fruits and then make them explode by dropping a fruit bomb on them. Gadgadsgame gameplay is very simple. The only controls required are the arrow keys. Up arrow/Space bar: Rotates the string of fruit. Left and Right arrows: Moves the string of fruit left or right. Down arrow: Accelerates the fruit's fall. Unlike most other games, there is no transitioning between levels. The game screen you start with remains for the entire duration of your game, all that changes are the different types of fruit that will fall and the speed at which the strings of fruits fall. When you begin the game, the fruits drop slowly in a string of three connected to each other. Take care where you place each piece, as they cannot be moved once they reach the bottom of the screen. You also want to group fruits of the same kind together as much as possible. This will earn you more points when you place a bomb later on. As you play you will also progress in levels, making new fruits available. After level five the speed at which the fruits drop will also greatly increase. To progress to level two you must place 18 fruit clusters. Each level following is advanced after 20 fruit clusters. There are two types of powerups available, bombs and morph potions. The occurrence of each of these is completely random. Fruit Bomb Removes any fruit it touches of the same colour that are linked in a chain. Twirly Fruit Potion Removes all the fruits of whichever colour it lands on. If it lands on the bottom of the screen it will remove the nearest colour. Fruit Elixir Turns all fruits of whichever colour it lands on into a different colour (i.e. all blue turn orange). If it lands on the bottom of the screen it will alter the colour of the nearest fruit. Points are earned when fruits are removed from the game board. Each single fruit removed is worth one point. However, grouping several fruits of the same colour will cause them to merge together and grow into a larger version. These groups must be aligned in perfect squares though. For example, 2x2, 3x3, 4x4 etc. These larger fruits are worth more points if they are bombed. It is common misconception that the game is lost once any fruit touches the top of the screen, however this is not true. 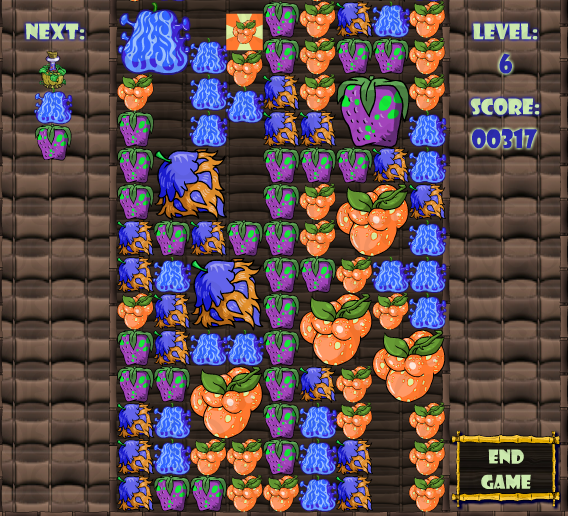 The game is only lost if the fourth column along is filled and no more fruits can be placed. If you are unsure which one is the fourth column during the game, it is the one that the fruit fall from. A common strategy is to push a particular coloured berry to one side with the hope of creating a large berry to bomb. Though it is true that this strategy can give a large amount of points for a single bomb, it is rather difficult and often fails. It is more reliable, in a similar way, to try and have as many fruit of the same colour as possible on the screen. Do this by using your Fruit Elixir potions to morph OTHER colours until they become the one you are saving. However, if you are trying this strategy, take care not to get too greedy and to bomb that colour when appropriate; it is better to get fewer points and keep playing than it is to go for a big payout and getting a game over. A second strategy considers the fact that only the fourth column ends the game. On most occasions you can reach a high level and even the avatar score simply by holding down the down directional button and pushing the fruit to the left or the right, avoiding the fourth column. However, it still helps to consider more carefully where you will place the fruit bombs. Always try to clear the largest group possible with them. This is a much simpler and easier way to play the game and often gives the same, if not better results than careful planning of each piece. However, if you are aiming for a high score beyond that of the avatar, we would suggest taking your finger off the down directional button. Though you can still follow the basic rule of strategy two - avoid the fourth column - you can be more careful in your placing and have more time to consider the best use of the fruit bombs. Send a score of 1,000+ points in Gadgadsgame.